For the vast number of patients that are concerned with the appearance of their front teeth, porcelain veneers can be the perfect solution. At Ocean Breeze Dental, when designing porcelain veneers, we pay close attention to the patients surrounding teeth and work very closely with our in house lab technicians who hand make each and every veneer to complement your overall smile. The result is the beautiful, attractive smile you want and deserve. Our veneers are hand made in our dental lab located in Rockledge, Fl from the most durable porcelains available, and if cared for properly, they will last you for many years. To prepare the tooth or teeth to be veneered the dentist removes the discolored or unsightly portion of the tooth and carefully shapes the tooth in preparation for the new veneer. Once all of the teeth are adequately prepared we will take an impression and select a shade. This impression will be sent to our in house lab where your new restoration will be delicately hand crafted. While the new veneers are created, we will provide you with a temporary restoration (if necessary). Our temporary restorations, when placed, will resemble your natural teeth so that you can go about your day to day routine with no interruptions. 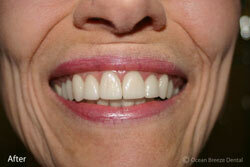 During your second visit to Ocean Breeze Dental, we will fit and place your veneers over your existing teeth. Following your final approval the veneers will be bonded in place, leaving you with a beautifully restored smile. Since porcelain veneers are more resistant to stains and chipping, they are generally more expensive. 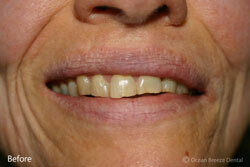 Lumineers are a popular type of porcelain veneers that do not require your teeth to be shaved.